It's Thursday and you know what that means..
1. 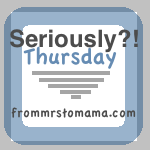 Seriously it's only Thursday?!! Yes, it was a short work week but holy heck am I have one rough freakin week. This week involved several glasses of wine to chill me out from crying from work related ish, a fussy teething baby, running over a median that I swear jumped out of no where, and a bad hair day that is today. 2. Did I seriously stay at work last night until 6 something all while my family was at dinner waiting on me? Yes, yes I did. Because I care too much and want to do my best at all times and it bites me in the booty every single time. I normally don't have a problem with speaking up for myself but this girl has got to do something different because it is stressing the heck out of me. 3. Every three months I crave a vacation. It's like clock work. I am dying for a mini vaca right now. Even if its going out to the beach for one night. I'm down. I just need a break. Preferably sit out on a balcony on the beach with my Sacred Marriage book and some wine and sit in silence. Probably sounds like a stupid vaca to most but I need this!! For my sanity please! 4. As much as I say I don't want C to start walking yet. I do! I do! I think it would be so much fun. It's hard to find things to do on the weekends when I'm off work for kids who don't walk. To be honest I really want to go to one of those inflatable or trampoline places with him and just jump and jump our hearts out. 5. 5:00 on Friday please come soon. I need you. Desperately. I agree....playgrounds with a walking baby are WAY more fun than a non walker! And your vacation sounds fabulous, can I crash?? Oh I bet he'll be walking soon! Is he close? I hope your Friday flies by and you enjoy a much needed weekend! I took Trey to a jumpy place way before he was walking - we still had a blast!!! Seriously - go! It's a great workout for you too!!! My calves KILLED me for days! How Does Dexter Do it?